One of the most critical steps in successful cell isolation is the preparation of the single cell suspension. Cell loss may occur during isolation if the sample contains cell clumps during the cell separation process. Additionally, the clumps may interfere with the proper labeling of the cells that the process is meant to target. By following a specialized protocol for harvesting and preparing the single cell suspensions from primary or frozen tissue before the process of cell separation, these issues can be avoided. These steps are designed to discuss the proper procedures for handling frozen samples and preparing them for single cell suspension. The vial of cells needs to be thawed by swirling it in a water bath of 37 degrees Celsius and then transferring the thawed cells into an aseptic 50 mL testing or conical tube. The vial is then rinsed using 1 mL of culture medium that contains 10 % FBS, which will recover the remaining cells and then transfer the medium into a new tube. Top the 50 mL tube with culture medium with 10 % FBS and gently invert to mix the contents of the tube. Centrifuge the tube at 300 x g for exactly 10 minutes at room temperature for the collection of the cells. Remove the supernatant and discard carefully, so as not to disturb the pelleted cells. A gentle tap on the tube will resuspend the pellet. Cells that appear clumpy will require DNase I to be added to yield a final concentration of 100 µg/mL. Swirl the tube while adding the DNase I drops to the cell suspension. The tube is ten incubated at room temperature for 15 minutes. Next, 25 mL of the culture medium with 2 % FBS is added to the mix while inverting the solution and centrifuge again. Discard the supernatant and resuspend the pellets, as before. Cells that still appear clumpy will be passed through a 30 µm to 70 µm cell strainer to a fresh conical tube and rinsed three time with the culture medium that contains 2 % FBS and strained. Finally, the cell suspension is ready for cell counting or other application, like cell isolation. To prepare a single cell suspension, the cells need to be dissociated from the sample. Use a sterile dish with culture medium or a dissociation enzyme to mince and harvest the tissue. Pass the sample through a cell strainer size of either 100 µm or 70 µm to a fresh conical tube. Add 2 or 3 mL of culture medium over the tissue and cells that remain in the strainer. Repeat this step and then discard strainer and remaining tissue. A culture medium is added to the conical tube up to 40 mL or 50 mL total volume and collect the cells using centrifugation. Remove the supernatant and discard, while trying not to disturb the pellet. Resuspend the pellet gently. An optional washing step can be used at this stage, which would include the adding of 25 mL of culture medium, inverting the cell pellet and solution mix, and centrifuge. The supernatant would be removed and discarded, and the pellet resuspended at this stage. Finally, the cell suspension would be ready for cell counting or other applications. The cell strainers are vital in this process, because they allow the cells to be separated from the tissue and a single-cell solution to be formed. Cell strainers are designed to fit on the 50 mL conical tubes, so they are easy to strain. They are designed to specifically allow only certain sized material to pass through and help to remove cell clumps. Various styles and sizes are available for different uses, depending on the application. Cell strainers are essential to the process of single cell suspension and help to create a sterile, easy, and quick way of successfully separating cells. Used for removing aggregates from the sample material and can be used to cultivate and produce cell spheroid cultures. Used for physical disruption of the tissue to gain primary cells from the tissue. The tissue is disrupted on the cell strainer. A connector ring can be added in a closed stated when working with a solution. It allows for the preservation of the cell culture medium and keeps the material from drying out. Used for the physical shredding of tough tissue, such as skin, fat, muscles, lung, or other similar tissues. The various cell strainer mesh sizes can be stacked to sieve various aggregate sizes. The sieves can be turned upside down to allow for flushing the material back into a new tube for further analysis and testing. 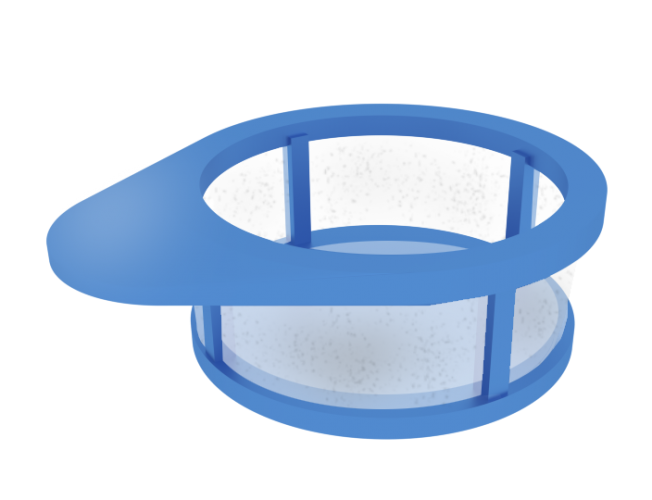 These disposable cell strainers are a more effective way of creating the single cell solution than a gauze filtration system and help to make the process quicker and easier.